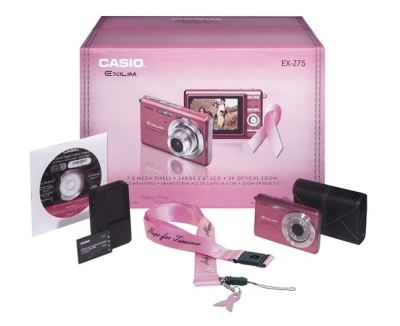 This month, Casio is supporting the National Breast Cancer Foundation (NBCF) with its release of a special-edition camera bundle, featuring a pink EX-Z75, a camera case embossed with the pink ribbon and a pink ribbon-clad lanyard. This special edition 7.2 megapixel digital camera has a 2.6-inch wide LCD display, Anti-Shake DSP for reducing photo blur due to shaky hands or moving subjects and an eBay mode, which allows photographs to be easily uploaded at the appropriate size for selling on eBay or for personal web use. Get yours today for only $179.99 at Staples, Sears, Adir, Fred Meyer, BJ’s, and Nexcom. WIN IT! 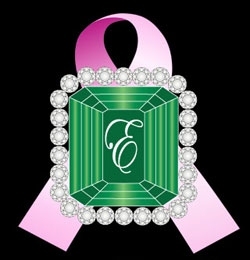 Through November 8th, all women with breast cancer can tell their story at EmeraldDreamBall.com to win an all-expenses paid trip to Vegas. Twelve incredible women will be flown out to Vegas on December 26th where they will indulge in a week-long makeover, including makeup application, luxurious spa products, and a new wardrobe. Capping off the week and 2007 is the New Year’s Eve charity ball deemed The Emerald Dream Ball. This is all thanks to Lana Fuchs of Lana Fuchs Couture and Vicki Tashman, a breast cancer survivor and the founder of Pink-Link.org. Frankie B. has teamed up with emerging artist Maya Hayuk to create a series of limited edition jeans for Y-ME National Breast Cancer Organizationâ„¢. No doubt, you’ve already seen Hayuk’s work on t-shirts, sneakers, and skateboards, but this is the first time she’s doing denim. 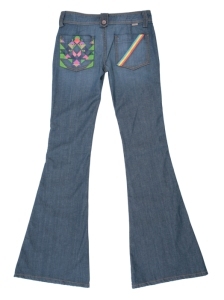 These special edition jeans retail for $196 and $40 from each sale will be donated to Y-ME. Hurry, there are only 500! Hard Rock is making noise with their Breast Cancer Awareness Pin! And who better to do it with than music superstar and breast cancer survivor Melissa Etheridge. This limited edition pin is part of Hard Rock’s Rocktober campaign, which raises funds for breast cancer awareness. All the proceeds will be donated to this year’s beneficiary, The Breast Cancer Research Foundation. Now the eighth in the Roctober series, this pin features a gold-based, double-neck guitar with a pink ribbon, with the message “Stop Breast Cancer for Life” on the body of the guitar. Get your pin for only $11 at Hardrock.com.